Doodle didn't win the presidency for 2012 and he congratulates President Obama for winning. Doodle is very old and will not live until the next election. However, he will still stand up for the bird party and will continue to post on this page about bird issues and conservation issues. He thanks everyone for their support and thanks all who did vote for him in 2012. He hopes everyone will support his offspring for president of the Bird Party in the future. Doodle has been through a lot in his life, so he has a little wisdom and experience. He's not rich, in fact he has no money to his name whatsoever. Nor does he own any property or anything else. All he has is his feathers, but even those fall out twice a year. Doodle also only has one good eye, but it's good enough to observe things. One thing you might notice is that he has something hanging out from his chin. That's his tongue. For some reason, it comes out behind his bill, possibly due a broken hyoid bone gotten during a fight last spring. It doesn't hamper him from doing anything. Doodle can eat and speak up just like any other duck. *Doodle ended up passing away shortly after this page was originally made in 2011, but this page will still remain and become a memorial page for Doodle and a page about conservation and wildlife management. Read more, below, about Doodle and his "campaign for president." 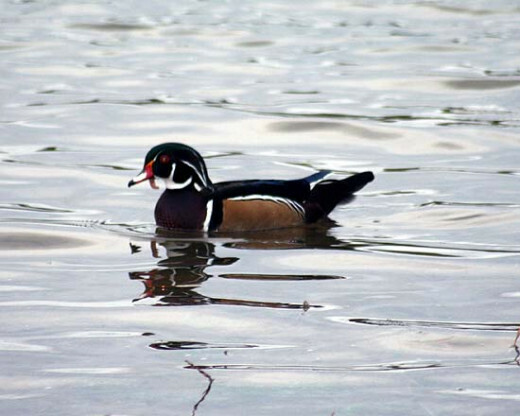 Wood ducks are tree ducks that like to roost and nest in trees. The female ducks look for a tree cavity or nest box and hatches her eggs there. Then, about a day after the ducklings hatch, she leaves the box and goes a short distance away and calls them. The babies then jump out of the tree and run to mother. When they're all together, they go to a safer place. 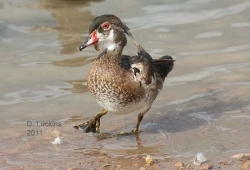 Male wood ducks don't participate in raising the ducklings, but they will guard their favorite female from other males which makes it easier for her to mind her ducklings. Doodle was probably one of those ducklings who once jumped out of a tree. And, he was probably one of those males that guarded a female with her own ducklings, too. But, during the campaign he had no mate or family. 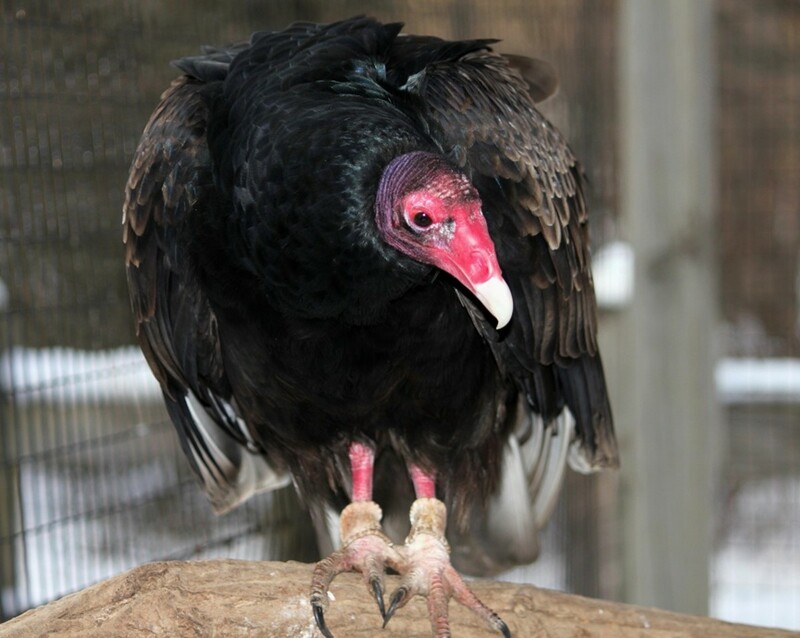 At one time, he looked like the brightly colored male in this photo, but as he got older and less healthy, he began to lose his colors. At the time of his campaign, he was trying to get his beautiful colors back. A young female often accompanied and looked after him as he got older. Other male ducks respected him, except one that bullied him and caused his eye and bill injury. His son began to be his bodyguard and while he was around, no one bothered Doodle. 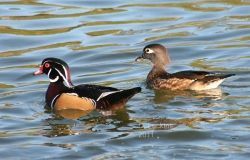 Learn more about Doodle's kind with this book on wood ducks and help his kind by setting up a wood duck nesting box. 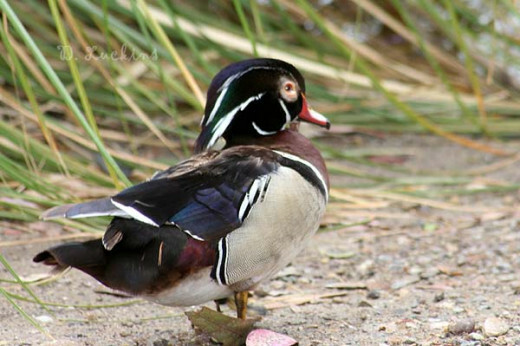 Where Doodle lived, wood ducks were uncommon and help is needed to bring their numbers up. 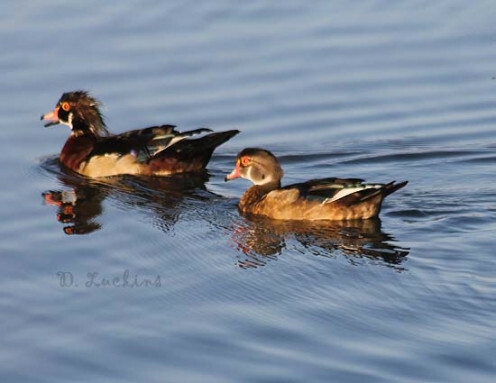 The author tells about his 50 years of personal experience and knowledge with wild wood ducks. Lots of great photos in this book. 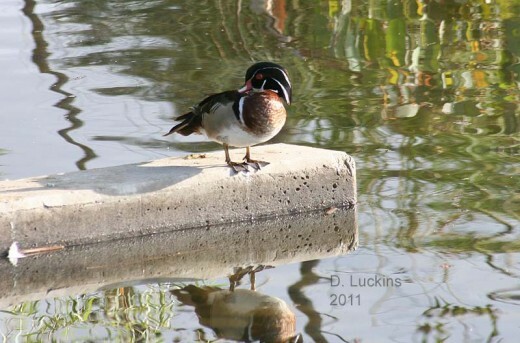 If you live near a waterway, help Doodle's kind by setting up a special nesting box. Then, when they start nesting in it, enjoy watching the ducklings "jump" out of the nest. This is Doodle in his pre-campaign days. 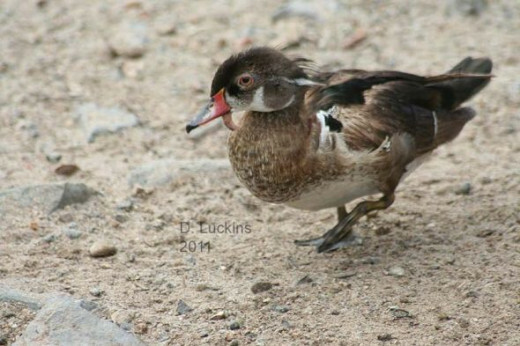 It just goes to show you that running for president can take a toll on a tiny wood duck. Doodle's campaign platform and slogan is pretty simple: "Bread for all". That's it. He wants every duck, er, human to have all the bread they want or need. Doodle is also for peaceful relations with other species, though he admits that sometimes it's necessary to step in to stop a fight or to stop an animal or human from mortally wounding each other. When told that bread wasn't really good for ducks, he says the statement "Bread for all" is really metaphorical. 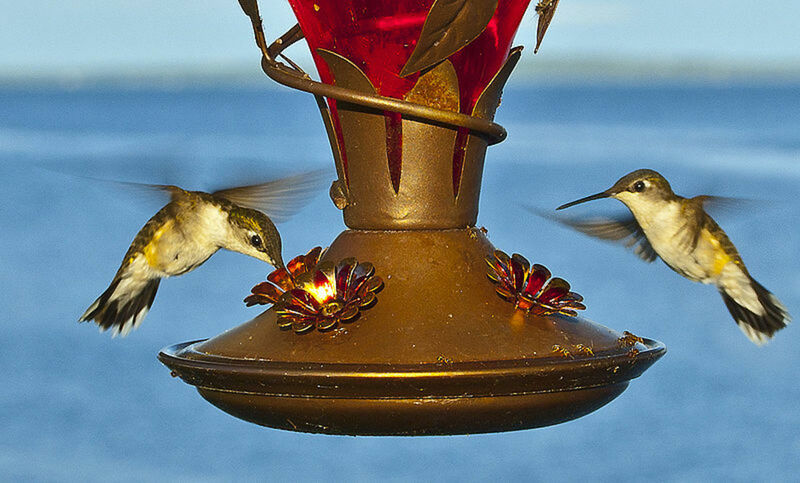 It means everyone should have access to yummy food, including corn, waterfowl food, veggies and bugs. He didn't think the statement "Corn for all" or "Bugs for all" was a good campaign slogan. Ducks, especially, seemed to relate to the "Bread for all" message. Doodle seems to have wrapped up the duck vote, that's for sure. Some of the geese said that they will wait and see who else steps up to run before making a decision about who they support. Doodle sits on the bank of his lake giving speeches to all who want to listen. He is often seen surrounded by coots, humans, and other ducks. Everyone loves to hear his high-pitched voice. He doesn't get involved in controversial human issues, though, but will intervene for his feathered friends. Here's a photo of Doodle on the run in order to get to a press conference. Doodle will not be making any more appearances. 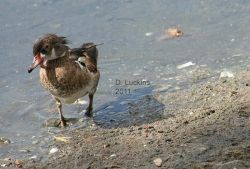 However, his son, Doodle Junior is currently making appearances near the front entrance to the lake along with Doodle's grandson. Look for him along the shoreline near where his father used to hang out. He is sometimes seen near the front entrance to the lake off of Kiowa drive. 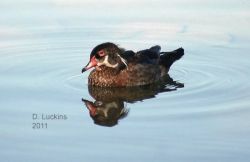 Unfortunately, since Doodle died, the wood ducks are becoming less frequently seen at this lake. Are you planning to vote I the next election? Are you planning to vote in 2018? Doodle wants to let people know that he is very pro-bird! He opposes any legislation that will harm his birdie friends and ducks. He's not against people hunting and understands that it is part of nature like that hawks and the eagles (though Doodle doesn't like it), but he is against careless and senseless killing. That is why he got so upset when that other candidate mentioned that 25 ducks were killed in a way that indicated that they didn't matter. They mattered to Doodle! But, Doodle isn't against people. He thinks that people and the birds can work together so that both their needs are met. Doodle is (or would be) concerned about the things going on with other ducks, even in other parts of the world. He likes to maintain good international relations with ducks, birds and people in other countries. 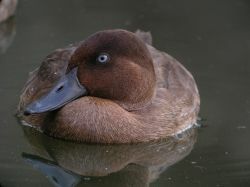 One of the birds he's concerned about is the Madagascar pochard, one of the rarest ducks in the world if not the rarest bird in the word. Recently, it was twice declared extinct, but was found living in a remote lake. 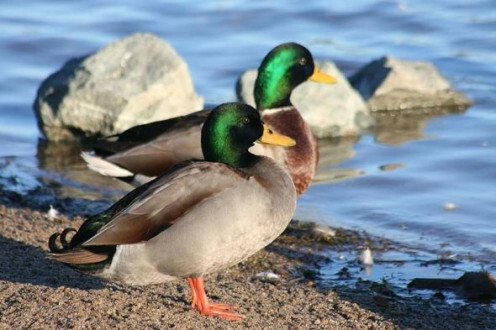 The Wildfowl and Wetlands Trust in the United Kingdom is currently working with bringing the duck back from the brink. They are also working on saving the spoon-billed sandpiper and other nearly extinct wetland birds. Donations must be made in British Pounds. Doodle likes that humans are so passionate about helping those ducks. Photo for this module is by Frank Vassen via Flickr. Pepper and his brother anxiously await for Doodle to make his appearance. Here are some items related to the upcoming 2018 election, past elections and how politics work in general. 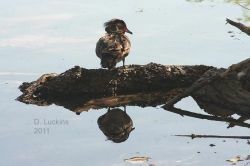 Doodle was an actual wood duck that lived in Lake Murray for a long time. However, in early October, 2011, he passed away from natural causes just as his campaign for president began. During the last two months of his life, he dealt with an eye infection that eventually got better, but never fully healed before his death. His tongue issue started early in the year around breeding season. 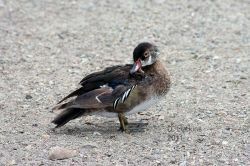 Doodle is suspected to be the father of several other wood ducks at Lake Murray and around San Diego. I decided to continue with the lens as if Doodle was alive at least through the end of the 2012 election. His sons and daughters still live at Lake Murray. Long Live Doodle! I really miss him greatly. All of the photos on this lens were taken by me during the last six months of his life. The photo in this module is the very last photo ever taken of him. His last day seen was a very good one, he was energetic and seemed to be very happy and content. Below is a video/slideshow about Doodle's last day seen alive. Doodle has only one simple statement: Bread for All. He doesn't answer questions that are outside the realm of his wood duck world. Very clever lens. You'll have to keep us posted as to Doodle's political successor, because I imagine he will be successful, following as it were in Doodle's wake. @timetoact: Awww, he would have loved our support. He loved everyone, especially those that talked to him. Doodle is a very handsome duck. I am sorry that he did not win the Presidency. He had a very good platform. Quite a clever lens - Doodle has my vote, that's for sure! I am thinking about changing my party to the Bird Party. The platform makes more sense. Doodle has my vote. I am considering coming to one of his appearances. It's not that far from us. LOL! I love Doodle! The title of the lens caught my eye as we have a little cat called Doodle (and her step-sister, Scribble). I think 'bread for all' is a great slogan for a presidential candiduck! Hello Doodle! 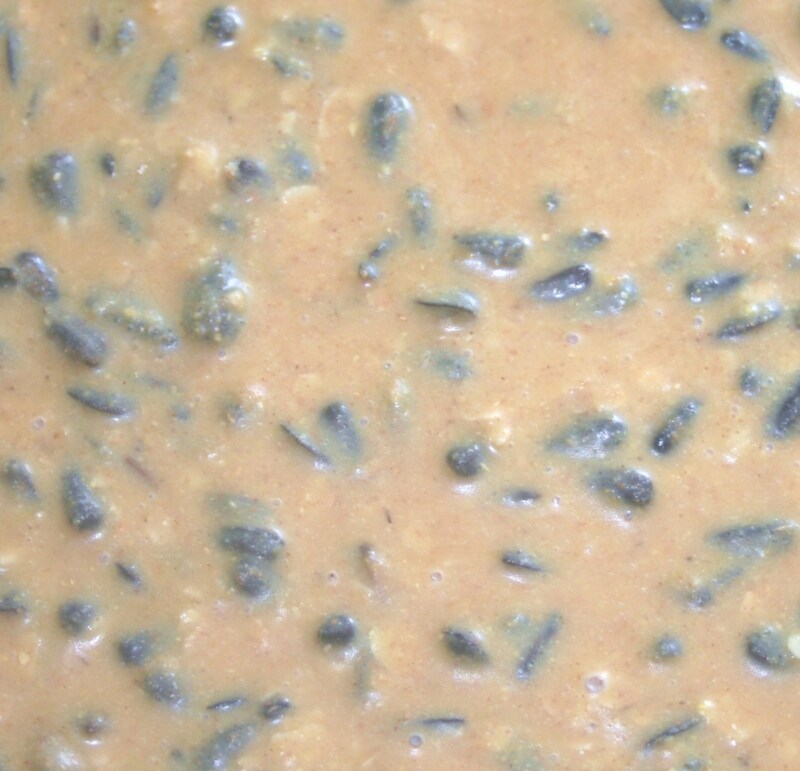 Congratulations on figuring out a platform (peace, ending hunger, and justice for all) that has eluded humans. We need a sane approach to politics worldwide. You would have my quack (or vote). @Countryluthier: Doodle is proud to be part of the Bird party. They are all over the political spectrum, but generally believe in peace, ending hunger, and justice for all. Doodle has my vote with his stance on bread for all ducks er humans, what party affiliation, Red, Blue, libertatian, Independent?